Friday morning, I wake up early. Craving for something nice for breakfast, and lucky me, I have the best bakery round the corner (that makes me REAL happy, my weight scale, not so much …). I go for a “feuilleté aux framboises”, basically raspberries folded in heavenly buttery pastry. Got home, put that on my new favorite plate, top that with fresh raspberries, brew some coffee and I was finally ready to devour that. Except that my plate was so pretty that I wanted to show it off and that’s when the endless photo snapping started. Shall I add some flowers to make it pretty-er, a fork, a knife maybe ? - while I know I’ll probably end up eating with my hands… - shall the coffee be on the right, on the left, in the middle ?? Snap, snap, snap, this angle, no, that angle, straighten the fork, the knife...15 photos later… I ended up with a feeling of frustration because these snaps were “not good enough”. But then I caught myself thinking why am I even allowing myself to get frustrated for such a small matter. 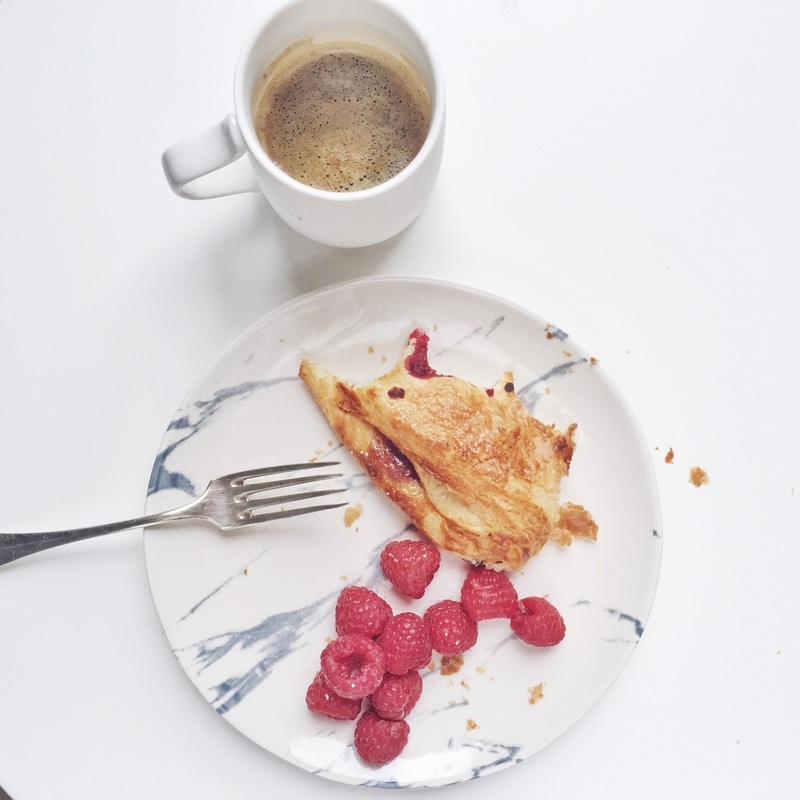 No one cares about this plate of raspberries and my coffee, like I remembered writing in this post. I don’t need to show a “perfect” breakfast to anyone. I suddenly remembered about this article and the “dream life” of instagrammers. So I just grabbed my half cold coffee and devoured that feuilleté aux framboises - with my hands. It was yummy, and it was messy, crumbs all over the place. And the more I was eating, the messier it was, the more empty my plate got, the more beauty I found in there, and THERE it hit me. It was imperfectly perfect. I snapped. And I loved it. I loved the beauty of the unplanned mess. It doesn’t have to be perfect to be pretty. It shouldn’t be. Because REAL life is not perfect. And I feel that my call is to reflect authenticity in my work so why should I pretend that my life is perfect. Imperfections are perfectly beautiful. I love them and I want to photograph them. I want to be me, the imperfect girl who eats with her hands, who’s not a size zero, and who loves butter, cheese, chocolate, and everything my bakery has to offer, in real life AND in the so call "social media life" . So to all of you out there, I want us to embrace our imperfections, those who make us who we are. I want to meet you and your imperfections and capture them and show the world how beautiful they are. Are we meeting soon?